The relationship over many decades between the CBC/Radio-Canada and successive federal governments is based on an understanding of how a public broadcaster operates: the government provides most of the funding but the politicians are historically, culturally and legally restricted in how much control they have over what the broadcaster does. This is the case where he who pays the piper does not get to call the tune – especially when it comes to reporting on political happenings. Called an arms-length relationship, the system is codified in the Broadcasting Act which was last overhauled by Brian Mulroney’s Conservative government in 1999. That version went so far as to say that the Act shall “protect and enhance the freedom of expression and the journalistic, creative and programming independence enjoyed by the Corporation.” Wording like that and other parts of the Broadcasting Act are what make the CBC/Radio- Canada a public broadcaster similar to those in other mature western democracies. Over the years there have indeed been battles between the CBC and some Prime Ministers of the day. Conservative John Diefenbaker often publicly criticized commentaries on CBC radio and Liberals Pierre Trudeau and Jean Chretien complained about alleged separatist sentiments among those working for Radio-Canada. But overall, there was more peace than warfare between the CBC and those in political power. Then, at the end of April, along came Bill C-60 which has worried many in Canada’s journalistic and freedom of expression communities. This Bill covers all Crown corporations and gives the government the right to be present at the bargaining table, giving it unprecedented involvement and control of crown corporations. That’s why CJFE has joined five other organizations to demand that the Harper Government exclude the CBC from C-60. These groups are the Canadian Association of Journalists (CAJ), the Fédération professionnelle des journalistes du Québec (FPJQ), ACTRA, and the Canadian Media Guild (CMG) and the Syndicat des communications de Radio-Canada (SCRC), the two unions representing journalists at the CBC’s English and French language divisions. 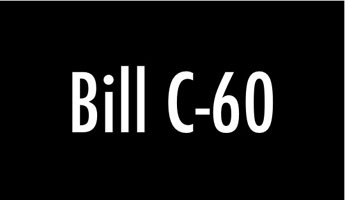 The six organizations will be holding a joint news conference Monday morning in the Centre Bloc of the Parliament buildings in Ottawa to present their case for the exclusion of CBC/Radio-Canada from C-60. "It is our duty in a democracy to fight to protect CBC's independence from any attempts at government control. Freedom of the press depends on it,” says Brian Myles, President of the FPJQ. The Bill gives the Treasury Board the right to approve Crown Corporations’ negotiating mandates, have a Board employee present at the negotiations between unions and management, and to approve the new contracts at the end of the process. It also calls for Treasury to fix the terms and conditions of “certain” non-union employees. In short, the Bill gives the government, through the Treasury Board, veto power when it comes to all these areas and, in the case of the CBC/Radio-Canada, possibly much more. For example, would those “non-union employees” involve the selection and employment conditions for news executives? Already the battle with the government over keeping CBC/Radio-Canada in C-60 is getting heated. Earlier this week the Corporation’s President Hubert Lacroix wrote the parliamentary Committee that the Bill, “would reduce the independence that is critical to our operation” and predicted that the Legislation may give rise to conflicts with the Broadcasting Act and the Charter of Rights. This, Lacroix said, “could potentially embroil the government, our Corporation, and its unions in litigation, a result that could be avoided with an amendment that protects the independence” of CBC/Radio-Canada. But his appeal was quickly rejected by Finance Minister Jim Flaherty who dismissed any possibility of changes to the Bill, “the CBC may think it is a special independent Crown Agency. This is wrong, all Crown agencies have a responsibility through Ministers back to Parliament, to the people of Canada. They can’t do whatever they want, particularly with taxpayers' money,” Flaherty said, without dealing with Lacroix’s many points about the Broadcasting Act and the potential of legal challenges. Nor did Flaherty note that at present the Prime Minister appoints the President and Board members of CBC/Radio-Canada and sets the amount of the annual funding grant that is provided to the Corporation. Obviously, Flaherty does not believe this is enough. Unlike other Crown Corporations, the contracts at CBC/Radio-Canada cover a large number of guarantees to protect and promote freedom for its journalists. Over the years management and labour, building on the principles in the Broadcasting Act, have reached agreement on many fundamental principles including a definition of news programming and the protection of journalists from outside pressure to shape their stories. With all the powers that Bill C-60 grants the government, what would stop it from delving into issues about what CBC/Radio-Canada does, particularly its coverage of political issues. If that were to happen the flow of information from Canada’s largest news organization to the public could be curtailed or severely limited. In any event, the implementation of Bill C-60 including CBC/Radio-Canada would destroy the current arms-length relationship between the government and the public broadcaster. CJFE is deeply worried about that possibility. We strongly believe that the more information the public has about how our country functions, the better. The present ongoing saga of financial malfeasance in the Senate is a vivid example of that. "For decades, there has been the delicate balance between government control and a truly free, independent public broadcaster,” says CJFE President Arnold Amber. “This Bill crashes through that, and could seriously affect what the CBC reports on, how it approaches programming, and how Canadians will think about the integrity of the CBC."